Everywhere in town, there were signs welcoming the hunters to the "Rooster Rush". We even had to try some "Ring Neck Ale" in honor of it! After a night in Winner, we woke to gloomy, grey, drippy skies. 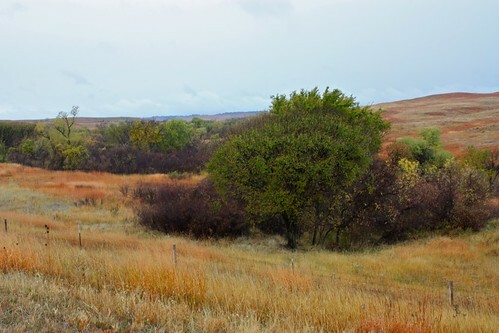 The moisture brought out the colors in the landscape and we loved the russet and ochre colors of the grasslands punctuated by the myriad shades of greens left in the trees! In some places the green had lightened to the point where it almost looked like spring rather than autumn! In the dry western prairies, trees only grow where there is water, so while the broad hill tops are grassland, every little gully seems to have trees. We loved all these little gullies of color! I wish the pictures did them justice. Eventually, we turned south to the LaCreek National Wildlife Refuge for a little bit of birdwatching. South of the refuge, the sunflower fields were filled with enormous flocks of redwing blackbirds and vesper sparrows. Such fun to watch them! Being on the prairie makes me want to get out my oil paints again, as I love the barns and grain elevators. This one is in the small town of Merriman, Nebraska. These lovely buttes are east of the town of Crawford, Nebraska, where my Uncle Jake and Aunt Olive used to have a grocery store, way back when! We were so busy looking at the buttes, that we missed the turn into town. We'll have to search out the store location (which was later purchased by another cousin of my Dads's) on a different trip. South of Scottsbluff, Nebraska, we turned onto highway 88 and saw these lovely buttes, known as Hogback Ridge, in the setting sun. Gorgeous! Catching up a bit and enjoying the sight of Autumn on the prairie. I had to laugh at the thought of the little town filled with pheasant hunters - we used to live in an Eastern Oregon town and that happened each year. What beautiful pictures. I was just out west this summer driving my son from Illinois to Spokane, Washington, with our trip originating in NMichigan, lots of driving! But gorgeous scenery as you captured so well in your photos.